Transparency Market Research (TMR) has published a new report titled, “Transcatheter Embolization and Occlusion Devices Market - Global Industry Analysis, Size, Share, Growth, Trends, and Forecast, 2018–2026”. According to the report, the global transcatheter embolization and occlusion devices market was valued at US$ 2.7 Bn in 2017 and is projected to expand at a CAGR of 7.9% from 2018 to 2026. Surge in incidence of cardiovascular diseases, respiratory disorders, and cancer are anticipated to drive demand for transcatheter embolization and occlusion devices during the forecast period. North America and Europe are projected to dominate the global transcatheter embolization and occlusion devices market owing to higher rate of adoption and awareness about transcatheter embolization and occlusion devices. Asia Pacific, Latin America, and Middle East & Africa are potential markets for transcatheter embolization and occlusion devices. The market in Asia Pacific is expected to expand at a CAGR of 8.8% from 2018 to 2026. Increase in obesity is leading to various disorders across the globe. According to the WHO, more than 1.9 billion adults were overweight in 2016. Of these over 650 million were obese. Most of the world's population lives in countries where overweight and obesity account more deaths than underweight. This is likely to increase the number of treatment procedures; consequently, propelling the global transcatheter embolization and occlusion devices market. The embolization coils segment is likely to account for major market share due to technologically advanced products adopted by health care providers. In terms of application, the global transcatheter embolization and occlusion devices market has been segmented into peripheral vascular disease, neurology, oncology, urology, and others. Peripheral vascular disease is projected to be a highly attractive segment during the forecast period. The segment is expected to continue to lead the market from 2018 to 2026 due to increase in geriatric population, changing lifestyles leading to a high prevalence of obesity, and rise in demand for minimally invasive procedures. However, the oncology segment is expected to expand at a high CAGR during the forecast period due to the rise in prevalence of cancer across the globe. In terms of end-user, the global transcatheter embolization and occlusion devices market has been classified into hospitals, ambulatory surgical centers, and clinics. The hospitals segment held major share of the global market in 2017. Growth of the segment can be attributed to the availability of multiple service options & devices and tie-ups with health care companies to enhance health care products and service offerings. Moreover, hospitals are the preferred choice due to availability of advanced technology and better health care services. The hospitals segment is expected to expand at a high CAGR, especially in developed countries, due to increase in geriatric population and rise in health care infrastructure and support. Additionally, surge in demand for transcatheter embolization and occlusion devices in ambulatory surgical centers during medical emergency is likely to drive the segment. In terms of region, the global transcatheter embolization and occlusion devices market has been segmented into North America, Europe, Asia Pacific, Latin America, and Middle East & Africa. North America dominated the global market in 2017. The market in the region is driven by highly developed health care sector, increase in awareness among health care providers about transcatheter embolization and occlusion devices, and continuous evolution of transcatheter embolization and occlusion devices. This region offers significant opportunities in the transcatheter embolization and occlusion devices market. The market in Asia Pacific is anticipated to expand at a high CAGR during the forecast period due to increase in awareness about transcatheter embolization and occlusion devices for therapeutics. Moreover, expansion of the health care sector in countries such as China, Japan, and India offers immense potential in the region. 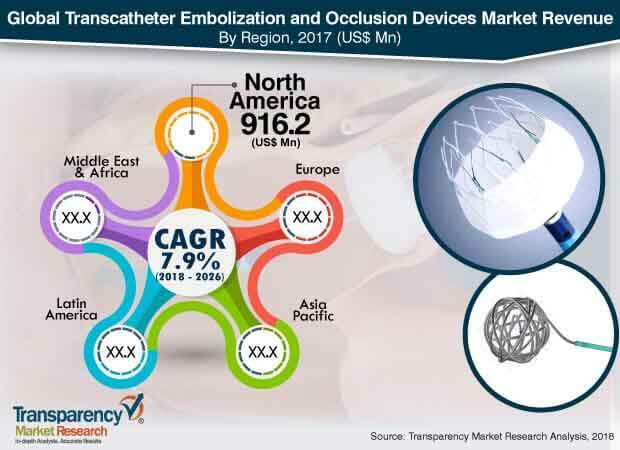 Technological advancements and increase in rate of adoption of transcatheter embolization and occlusion devices products are expected to propel the market in the region during the forecast period. The global transcatheter embolization and occlusion devices market is highly fragmented in terms of number of players providing different products. Key players in the global market include BTG plc, Boston Scientific Corporation, Medtronic plc, Penumbra, Inc., Cook Medical, Edwards Lifesciences Corporation, Merit Medical Systems, Johnson & Johnson Services, Inc., Pfizer, Inc., Stryker Corporation, Terumo Corporation, Sirtex Medical Limited, and Abbott Laboratories. Expansion of product portfolio through mergers and acquisitions is a key strategy followed by these players.